It took a natural disaster to do what no movement could, in a few days. Hurricane Harvey hit the Gulf Coast of Texas and hit Houston particularly hard over the past several days, claiming lives and destroying homes and properties beyond counting at this point. Because at this point, it’s not over. That’s what my guests on radio said Monday, after three days of Harvey’s battering set new records with torrential downpours measured in feet, not inches and caused catastrophic, life-threatening flooding ‘of biblical proportions’ according to ongoing accounts and projections for the near and even long term future. Long said earlier that FEMA will likely be in Texas for years, and that Harvey will require one of the largest recovery housing efforts the nation has ever seen. Harvey will likely surpass 2008’s Hurricane Ike and 2001’s Tropical Storm Allison, two of the most destructive storms to hit the Gulf Coast in recent memory, he said. Millions of people from Corpus Christi to New Orleans were under flood watches and warnings Monday as Harvey’s storm bands repeatedly pummeled the same areas. The Pentagon is also identifying resources, including trucks, aircraft and troops, that can be dispatched for hurricane relief if the request comes, defense officials said, and Gov. Greg Abbott has activated the entire Texas National Guard, roughly 12,000 Guardsmen, he said Monday. Throughout Tuesday, the crisis grew. The slow moving storm had shattered records for rainfall and heights of floodwaters, and sheer numbers of desperate citizens in need of relief. And that was before Hurricane Harvey was expected to swing back for a second landfall on the same battered Texas region by Wednesday. People are battered along with the land. They have crisis fatigue, they’re frightened and have lost personal property, possibly everything they had, have stood on roofs or tops of cars or waded through waist high water with all sorts of hazards underneath, just to survive. Life has taken on new meaning. And so has the sense of what is important. This comes when the country has crisis fatigue. We’ve had months of politically charged partisan and ideological battles not only without common sense or common ground, but with people focused distinctly on not ceding ground to political or ideological opponents. It has been bitter, divisive, toxic and noxious. 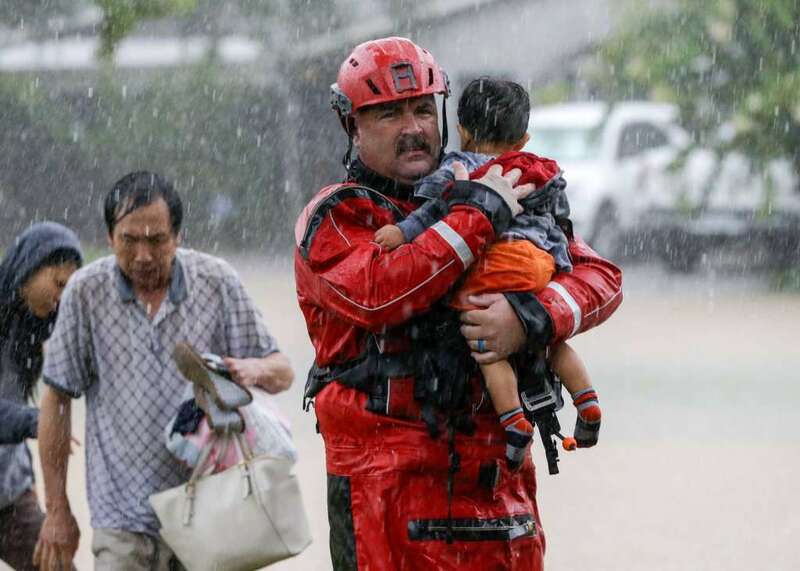 In the first few days of a natural disaster that threatens more harm to people in its path, Americans of all sorts have raced from their homes and towns to help fellow Americans suffering from the wrath not of political, social or cultural storms of hatred or discrimination or intolerance but of the sheer force of a raging storm of nature. The ‘Us’ grew to all people in harm’s way, and the ‘Other’ was the relentless invading Hurricane Harvey. With news crews planted and traversing the storm ravaged areas to update reporting on latest damage estimates and newest surge of floodwater and worst areas hit by relentless rain, horrified viewers couldn’t miss the battalions of relief workers also pouring in, and average citizens racing private boats and trucks to the scene to rescue people and deliver supplies and bring relief. That has been a saving grace in these scary days, the countless people helping countless people, without a clue to their identities or politics, ethnicity or religion. This is the way it should be. And the way it is. Read that, all of it. And it’s only a glimpse of a much larger presence of helpers. There’s the ‘Cajun Navy‘, among so many other relief workers. The Cajun Navy is part of an armada of private boats that have descended on the Houston area after authorities asked for help from those who could potentially navigate the treacherous floodwaters across a massive swath of southeast Texas in search of residents. Many boaters from east Texas and west Louisiana streamed to the outskirts of the disaster until they could drive no more, switching over to boats to go door to door seeking out the stranded. The headline of that news story said they’re ‘paying it forward’. Said one member of the Cajun Navy. And keep the effort going.